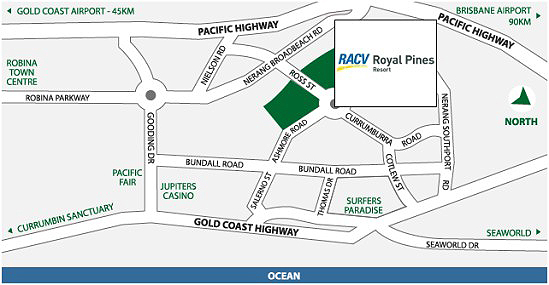 The Royal Pines Resort is located 32km north of Gold Coast Airport and 80km south of Brisbane International Airport. For guests travelling to and from Brisbane, the Gold Coast is connected to Brisbane by a rail service. The Nerang Rail Station is five minutes drive from the Resort. Exit Pacific Highway at Nerang Broadbeach Road turn off (EXIT 71). Follow Nerang Broadbeach Road through to Ross Street (located on left hand side). The turn off is the intersection located straight after “Carrara Sports Complex” (located on left hand side). Turn left into the Resort from Ross Street. Follow road to hotel reception for *valet to park your car (*charges apply). RACV Royal Pines Resort has a large amount of undercover and outdoor car parking. Car parking is complimentary for self-parking or Valet Parking is available through Concierge at the Hotel Reception for $8.00 per day. For more information about the venue please visit the website.